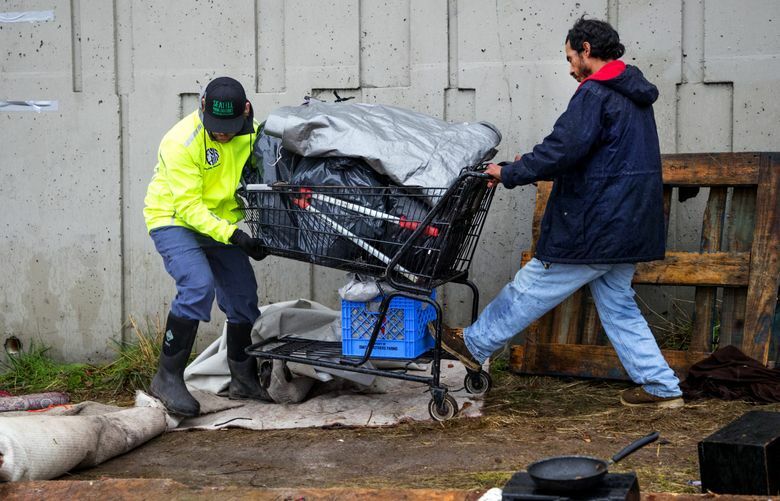 The Seattle City Council moved Wednesday to reduce a proposed expansion of the city’s team responsible for overseeing removal of homeless encampments, redirecting the money to wage increases for homeless service workers. The 6-3 vote was a preliminary action, with the final budget set for adoption Monday. But the proposal, sponsored by Councilmember Teresa Mosqueda, sparked debate among council members and protests from business and neighborhood groups who want a more vigorous response to the city’s estimated 400 unsanctioned tent camps. Seattle Mayor Jenny Durkan had proposed expanding the Navigation Team, which includes outreach workers and police, by nine positions in her budgets for 2019 and 2020. City council staff said at least some of the positions already had been hired, using $500,000 allocated by King County over the summer to allow the team to expand to 30. Mosqueda said her proposal would reduce that expansion to six next year, and seven in 2020, and would use the $724,000 in savings to give wage increases of two percent to more city-contracted human-services workers at nonprofit agencies than Durkan’s budget proposed. “If anything, the City should be allocating more funding to the Navigation Team to allow for additional capacity, faster response times and deeper reach into all of the affected neighborhoods across the City,” he wrote. Sawant, however, proposed to eliminate all Navigation Team spending and use the money instead for affordable housing. It was rejected in an 8-1 vote. Council member Sally Bagshaw, who spoke out against Mosqueda’s proposal, cited the fact that San Francisco’s version of the Navigation Team was more than double the size of Seattle’s. “I don’t think the Nav Team needs to be reduced, it needs to be expanded and multiplied,” she said. The vote came a day after an advisory committee, which oversees city rules regarding homeless-encampments removals, recommended the city increase Navigation Team staffing and to respond more quickly to encampments that are considered obstructions, such as those that block rights of way. The city already has dramatically increased its actions in unauthorized tent camps. From February to December 2017, 142 encampments were removed, with residents given 72-hour notice, and 49 obstructions or hazards were removed with no notice given, according to a presentation at the Tuesday night advisory-committee meeting. Contrast that with January to October 2018, when 179 encampments and 205 obstructions or hazards were removed. Outreach also has increased. In 2017, the Navigation team made more than 7,300 contacts with unsheltered homeless people; 1,179 people accepted some sort of service and 675 were referred to shelters. In 2018, the team has made more than 8,000 contacts, referring nearly 1,000 people to shelters. Seattle Times staff Daniel Beekman and Jonathan Martin contributed to this report.